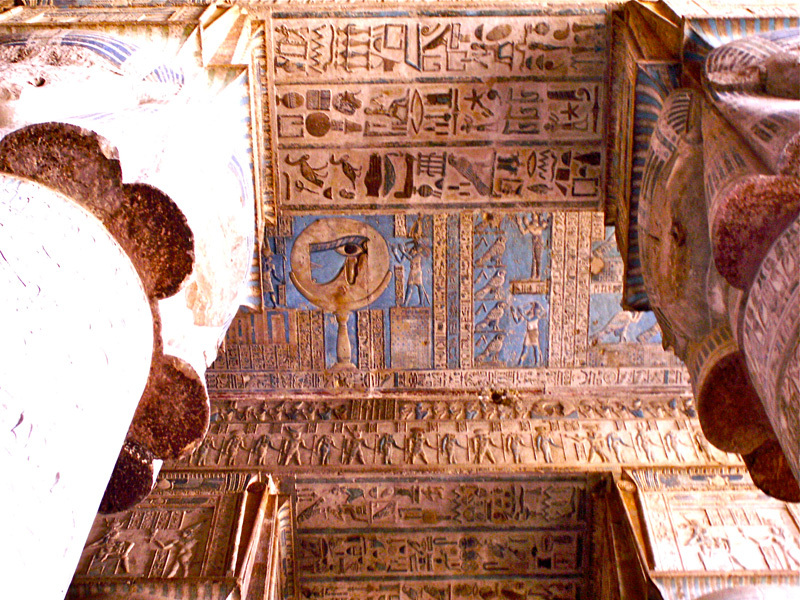 You can see on the ceiling where there is the blue color a huge round Mirror with Inside the Eye of Ra and Thot-Tehuti beside, watching it . The meaning of this is that mirrors were everyday used Inside the darker parts of the temples in order to reflect the sunny light of Ra everywhere. This was a very strong symbol.The eye of Ra means the Sunny light going everywhere, it is to say : the knowledge and Thot is the one by who all this happens. Thot is the responsible for the coming of Ra on earth by the way of a technology (the Mirror), he is responsible for the coming on Earth of the divine knowledge (the light) by a special process of attraction (reflection by Mirror) adapted to the conditions on the earth(density,gravity). Mirroring the divine, he got for Egypt all the process of knowledge.